Sitting on Dauphin Island at the entrance to Mobile Bay, Fort Gaines occupies a strategic site that had been the scene of military conflict more than 150 years before the Civil War. The strong, pentagonal fort was constructed in the mid 1800s to deter naval attacks on Mobile Bay. On August 5, 1864, 800 Confederate troops held Fort Gaines as Union Adm. David Farragut’s fleet of 18 ships began its attack. Despite Confederate mines and intense fire from Fort Gaines and Fort Morgan, to its east, Farragut overpowered Confederate naval resistance in the bay, allowing Union troops to lay siege to Fort Gaines. Outnumbered and outgunned, Fort Gaines surrendered on August 8; Fort Morgan fell 15 days later. Today, Fort Gaines faces a foe equal to Farragut’s fleet: the Gulf of Mexico. Each year the waves reclaim an average of 10 feet of land — 400 feet of historic battlefield have already been lost — complicating the continued operation of Fort Gaines Historic Site. The loss of established dune systems will turn the Dauphin Island’s freshwater lake and swamp into a salt-water environment, requiring residents to find a new source of drinking water. Eventually, the Gulf could bisect the island, stranding Fort Gaines and other culturally important areas. Erosion is a natural process, but a 2007 U.S. Geological Survey report concluded that dredging practices in the Gulf have significantly hastened the loss of the island. This finding prompted the Alabama Trust for Historic Preservation to list Fort Gaines as one of its “11 Places in Peril” for 2008. The Town of Dauphin Island is seeking help from Congress to undertake a comprehensive feasibility and design study to determine if constructing an engineered beach, which has proven relatively successful in stabilizing neighboring shorelines, would stabilize the island and maintain it as a buffer for the mainland. 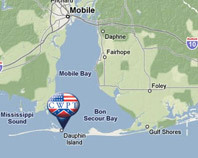 CWSAC has classified Mobile Bay as a Priority I, Class A battlefield — its highest designation.